Engraver Pen Cordless Etching Tools with Carve Tool 5 in 1 Set You will get all in Picture: for Wood Metal Plastic Zippo Plastic Jewelry Glass and etc by udomwitfba at Vains Faktory. MPN: unknown. Hurry! Limited time offer. Offer valid only while supplies last. 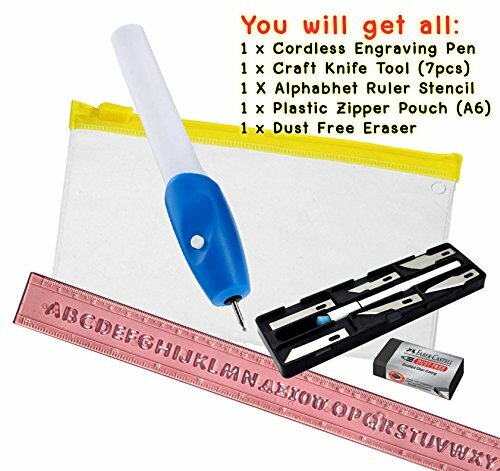 SET OF 5 pieces: Engraver Pen + Carve Tools, All you need set. EASY TO USE Engraver Pen operated by 2 x AA Batteries (Not included). ENGRAVE ALL YOU NEED: Leather, Plastic, Wood, Glass, Jewelry, Metal, Zippo, Steel, CD and everything you need. Not recommended to use the engraver pen directly to ruler stencil, please draw the shape first and then use the engraver pen to engrave it. If you have any questions about this product by udomwitfba, contact us by completing and submitting the form below. If you are looking for a specif part number, please include it with your message.